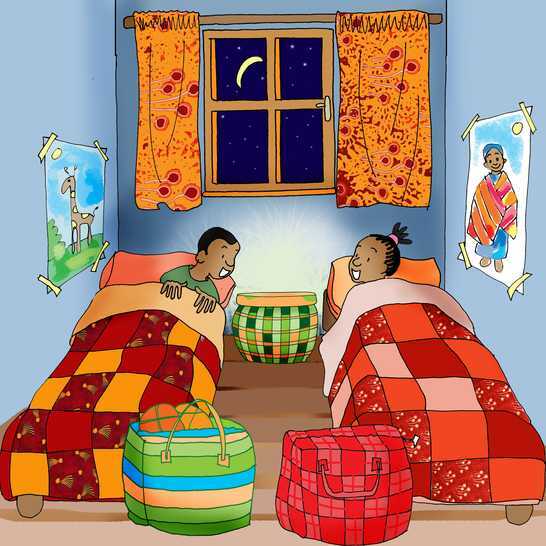 Odongo and Apiyo lived in the city with their father. They looked forward to the holidays. Not just because school was closed, but because they went to visit their grandmother. She lived in a fishing village near a large lake. Odongo et Apiyo vivaient dans la ville avec leur père. Ils avaient hâte aux vacances. Non seulement parce que l'école serait fermée, mais parce qu'ils iraient rendre visite à leur grand-mère. Elle vivait dans un village de pêche près d'un grand lac. 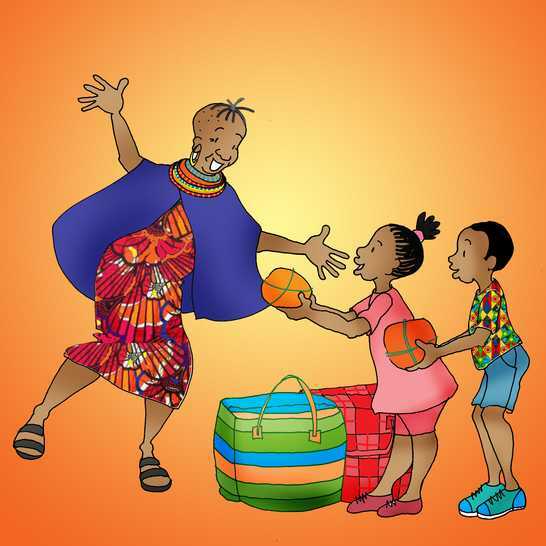 Odongo and Apiyo were excited because it was time to visit their grandmother again. The night before, they packed their bags and got ready for the long journey to her village. They could not sleep and talked the whole night about the holiday. Odongo et Apiyo avaient hâte parce que c'était le temps de rendre visite à leur grand-mère de nouveau. La veille, ils ont fait leurs valises et se sont préparés pour le long voyage jusqu'à son village. Ils ne pouvaient pas dormir et ils ont parlé toute la nuit à propos des vacances. Early the next morning, they left for the village in their father’s car. They drove past mountains, wild animals and tea plantations. They counted cars and sang songs. Early the next morning, they left for the village in their father's car. They drove past mountains, wild animals and tea plantations. They counted cars and sang songs. Tôt le lendemain matin, ils sont partis vers le village dans la voiture de leur père. Ils ont vu des montagnes, des animaux sauvages et des plantations de thé. Ils ont compté des voitures et ont chanté des chansons. After a while, the children were tired and fell asleep. Après un certain temps, les enfants se sont endormis, fatigués. 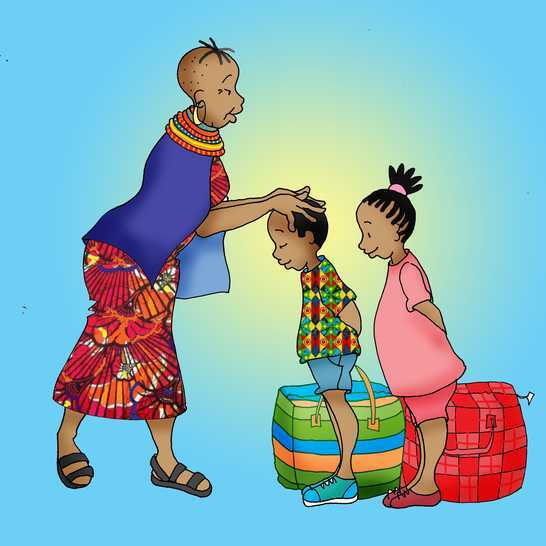 Father woke up Odongo and Apiyo as they arrived in the village. They found Nyar-Kanyada, their grandmother, resting on a mat under a tree. Nyar-Kanyada in Luo, means ‘daughter of the people of Kanyada’. She was a strong and beautiful woman. 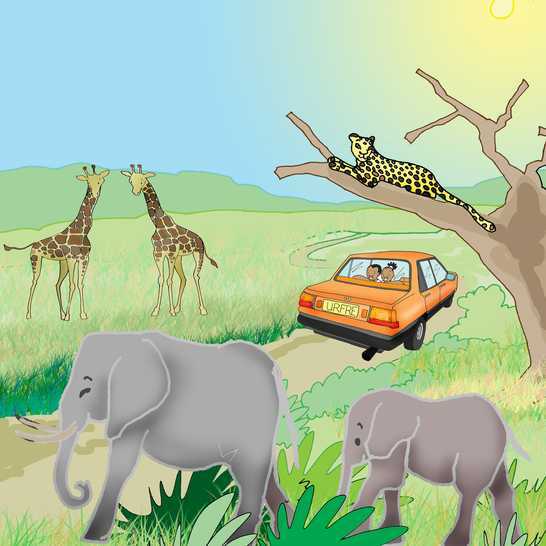 Father woke up Odongo and Apiyo as they arrived in the village. 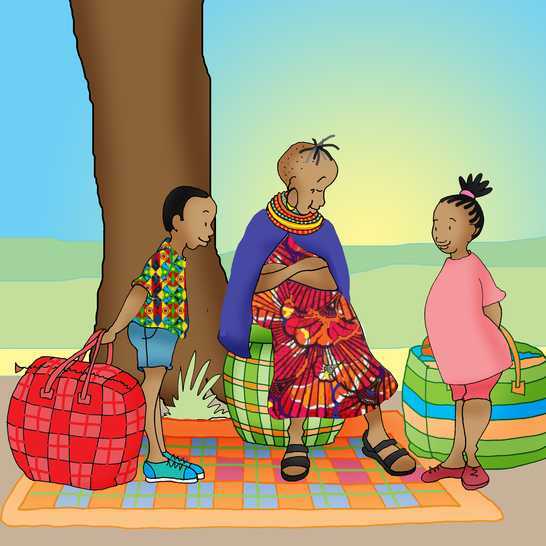 They found Nyar-Kanyada, their grandmother, resting on a mat under a tree. Nyar-Kanyada in Luo, means 'daughter of the people of Kanyada'. She was a strong and beautiful woman. Papa réveilla Odongo et Apiyo lorsqu'ils arrivèrent au village. Ils ont trouvé leur grand-mère Nyar-Kanyada assied sous un arbre. En le luo, Nyar-Kanyada veut dire « fille du peuple de Kanyada ». Elle était une femme belle et forte. Nyar-Kanyada welcomed them into the house and danced around the room singing with joy. Her grandchildren were excited to give her the presents they brought from the city. “First open my gift,” said Odongo. “No, my gift first!” said Apiyo. Nyar-Kanyada welcomed them into the house and danced around the room singing with joy. Her grandchildren were excited to give her the presents they brought from the city. "First open my gift," said Odongo. "No, my gift first!" said Apiyo. Nyar-Kanyada les a accueillis dans sa maison et a dansé tout autour de la salle en chantant de bonheur. Ses petits-enfants avaient hâte de lui donner les cadeaux qu'ils avaient apporté de la ville. « Ouvre mon cadeau en premier, » dit Odongo. « Non, ouvre le mien en premier ! » dit Apiyo. After she opened the presents, Nyar-Kanyada blessed her grandchildren in a traditional way. Après avoir ouvert ses cadeaux, Nyar-Kanyada donna une bénédiction traditionnelle à ses petits-enfants. 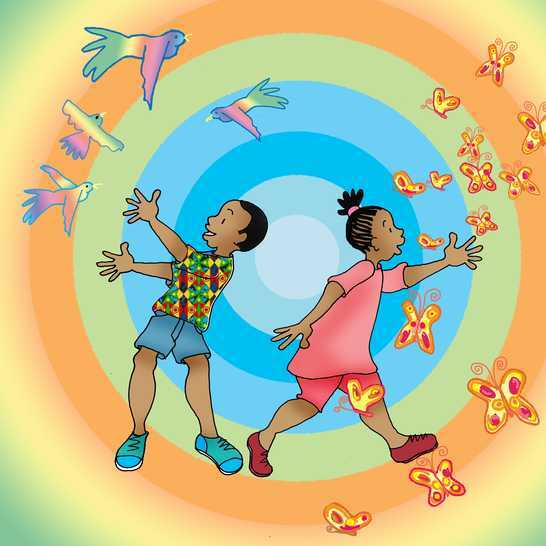 Then Odongo and Apiyo went outside. They chased butterflies and birds. Ensuite, Odongo et Apiyo sont sortis dehors. Ils ont poursuivit des papillons et des oiseaux. 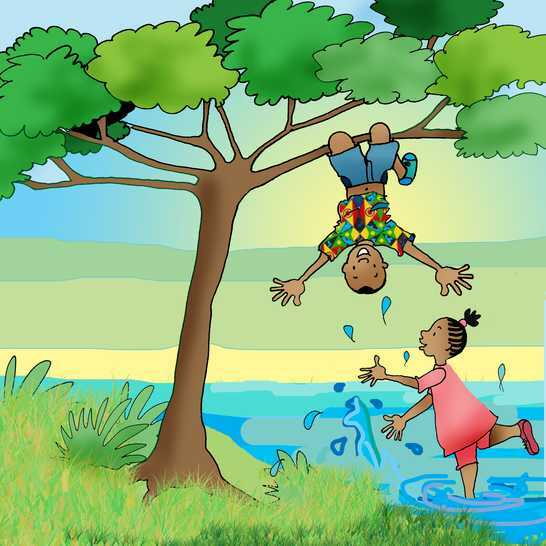 They climbed trees and splashed in the water of the lake. Ils ont grimpé des arbres et se sont éclaboussés dans l'eau du lac. When it was dark they returned to the house for dinner. Before they could finish eating, they were falling asleep! Quand la nuit tomba ils sont retournés à la maison pour souper. Avant qu'ils puissent finir de manger, ils s'endormaient ! 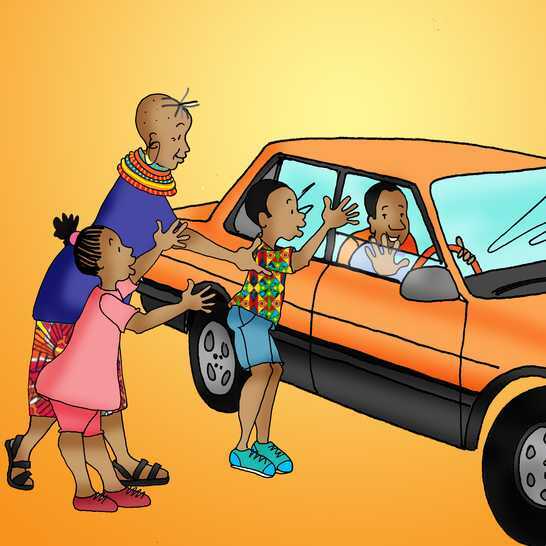 The next day, the children’s father drove back to the city leaving them with Nyar-Kanyada. 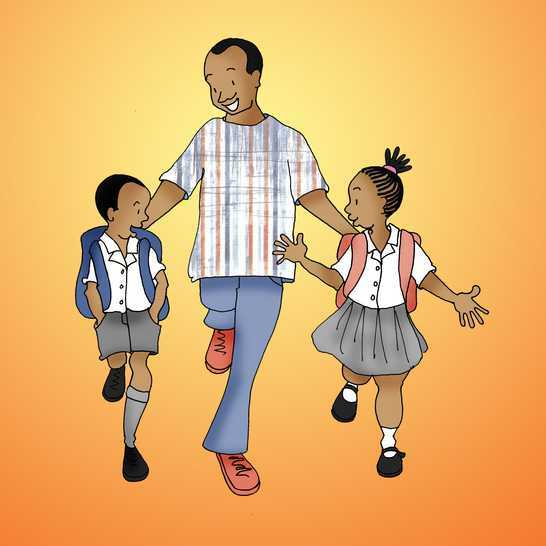 The next day, the children's father drove back to the city leaving them with Nyar-Kanyada. Le lendemain, le père des enfants est retourné à la ville, les laissant avec Nyar-Kanyada. 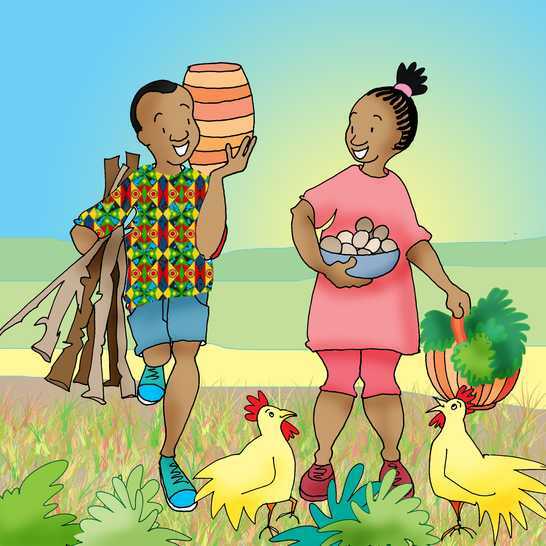 Odongo and Apiyo helped their grandmother with household chores. They fetched water and firewood. They collected eggs from the chickens and picked greens from the garden. Odongo et Apiyo ont aidé leur grand-mère à faire les tâches ménagères. Ils sont allés chercher de l'eau et du bois de chauffage. Ils ont recueilli les œufs des poules et ont ramassé des verts dans le jardin. 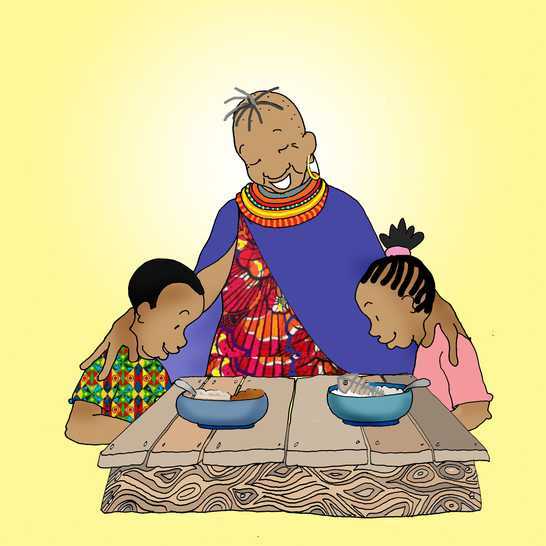 Nyar-Kanyada taught her grandchildren to make soft ugali to eat with stew. She showed them how to make coconut rice to eat with roast fish. 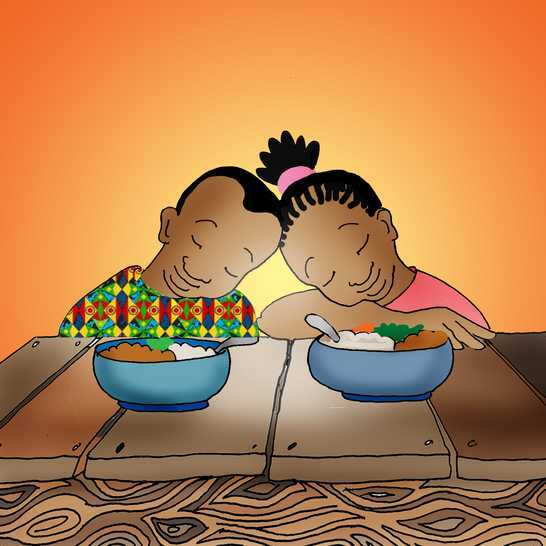 Nyar-Kanyada a montré à ses petits-enfants comment faire de l'ugali mou pour manger avec du ragoût. Elle leur a montré comment faire du riz de noix de coco pour manger avec du poisson grillé. One morning, Odongo took his grandmother’s cows to graze. They ran onto a neighbour’s farm. The farmer was angry with Odongo. He threatened to keep the cows for eating his crops. 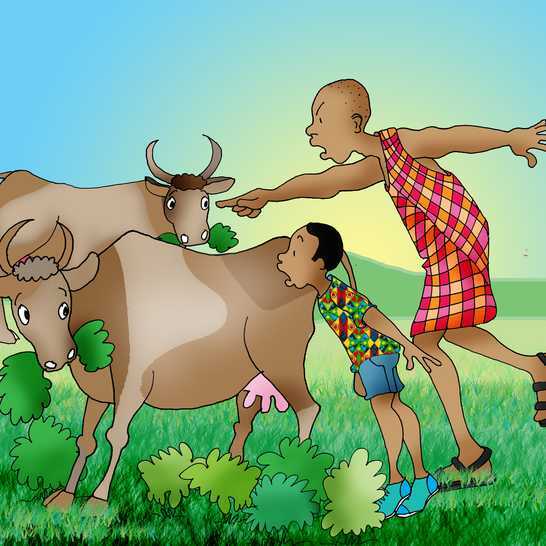 After that day, the boy made sure that the cows did not get into trouble again. One morning, Odongo took his grandmother's cows to graze. They ran onto a neighbour's farm. The farmer was angry with Odongo. He threatened to keep the cows for eating his crops. After that day, the boy made sure that the cows did not get into trouble again. Un matin, Odongo a apporté les vaches de sa grand-mère paître. Elles se sont rendues dans la ferme d'un voisin. Le fermier était fâché envers Odongo. Il a menacé de garder les vaches pour avoir mangé ses récoltes. Après ce jour-là, le garçon a veillé à ce que les vaches n'attirent pas d'ennuis. 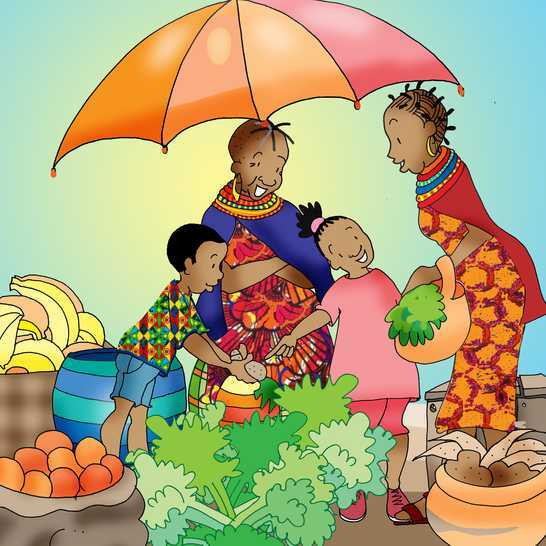 On another day, the children went to the marketplace with Nyar-Kanyada. She had a stall selling vegetables, sugar and soap. Apiyo liked to tell customers the price of items. Odongo would pack the items that customers bought. Un autre jour, les enfants sont allés au marché avec Nyar-Kanyada. Elle avait un stand pour vendre des légumes, du sucre et du savon. Apiyo aimait donner le prix des articles aux clients. Odongo emballait ce que les clients achetaient. At the end of the day they drank chai tea together. They helped grandmother to count the money she earned. À la fin de la journée, ils ont bu du thé chai ensemble. Ils ont aidé leur grand-mère à compter l'argent qu'elle avait gagné. But too soon the holidays were over and the children had to go back to the city. 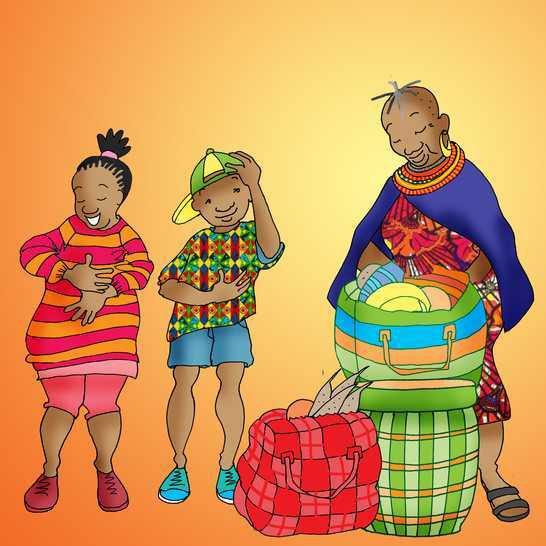 Nyar-Kanyada gave Odongo a cap and Apiyo a sweater. She packed food for their journey. Trop tôt, les vacances étaient terminées et les enfants devaient retourner à la ville. Nyar-Kanyada donna une casquette à Odongo et un chandail à Apiyo. Elle emballa de la nourriture pour leur voyage. When their father came to fetch them, they did not want to leave. 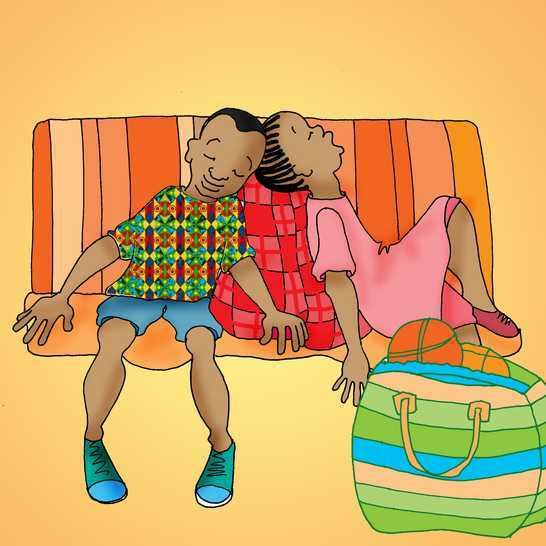 The children begged Nyar-Kanyada to go with them to the city. She smiled and said, "I am too old for the city. I will be waiting for you to come to my village again." 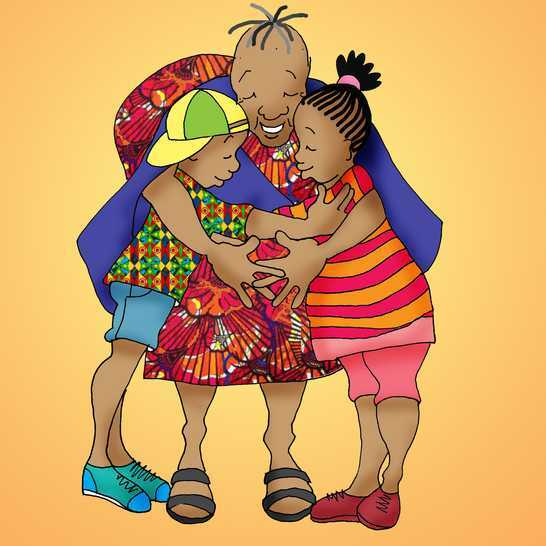 Odongo and Apiyo both hugged her tightly and said goodbye. Odongo et Apiyo l'on tous les deux embrassé fort et lui on dit au revoir. 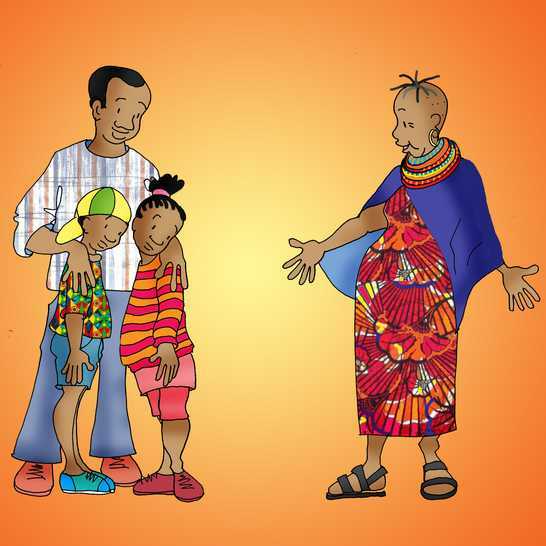 When Odongo and Apiyo went back to school they told their friends about life in the village. Some children felt that life in the city was good. Others felt that the village was better. 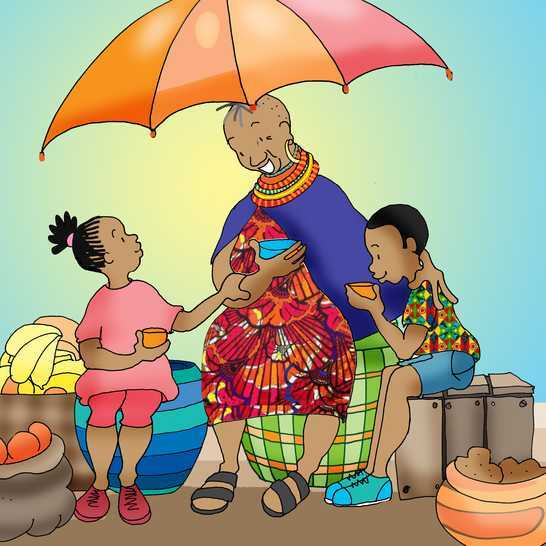 But most of all, everyone agreed that Odongo and Apiyo had a wonderful grandmother! 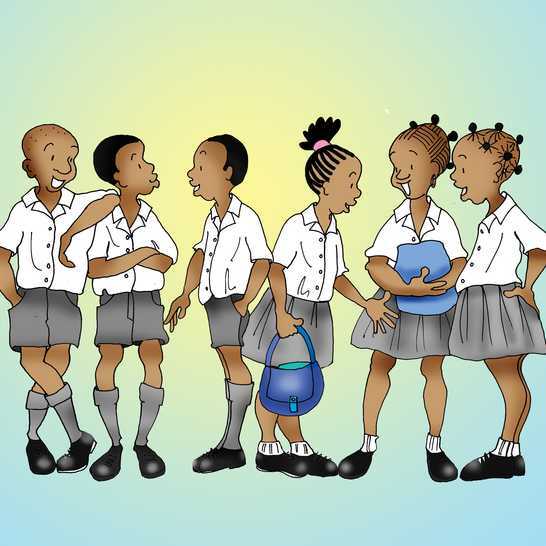 Quand Odongo et Apiyo sont retournés à l'école ils ont raconté leurs histoires de la vie dans le village à leurs amis. Certains enfants croyaient que la vie en ville était bonne. D'autres étaient de l'avis que le village était meilleur. Surtout, tous étaient d'accord que Odongo et Apiyo avaient une grand-mère merveilleuse !